It is not a very detailed story with a lot of specifics left out. A story of a number of people from an unknown country trying to find someone but not knowing where to look. That story is only found in the gospel of Matthew. Magi, sometimes translated wise men or kings from the east, come to Jerusalem intent on worshipping the newly born "King of the Jews". 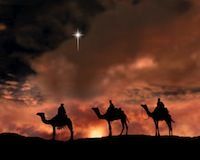 They eventually follow a star to Bethlehem where they found Mary and the child, and scripture says they "fell down and worshipped Him. And when they had opened their treasures they presented gifts to Him: gold, frankincense and myrrh" (Matthew 2:11). Then they returned to their country to be memorialized in song and story. Of all the elements that intrigue me about this story, there is one that enthralls me. They travel some distance to find Jesus and worship Him. It is that desire or need to find Jesus that I have observed personally. I have seen people travel by plane, car, bus, taxi, bicycle, and on foot all to hear of Jesus. Some traveled for days or walked 30, 40, 50 miles just to listen and study about this Savior. Regardless of where my colleagues and I go in this world, there are people who come to hear, learn, and study about Jesus. And some obey his call and are baptized. Like the Magi of old, people today will follow the signs that lead them to Jesus. If you are still traveling, still looking for Jesus, I can tell you how and where to find him. Email me at bbrant@heraldoftruth.org or join the conversation on our blog at www.hopeforlife.org. "Traveling" by Bill Brant is licensed under a Creative Commons License. Heartlight encourages you to share this material with others in church bulletins, personal emails, and other non-commercial uses. Please see our Usage Guidelines for more information.